Order custom ticket printing for your next event and enjoy the benefits of being able to choose the features that are right for you. We offer four different ticket sizes from something small like 2" x 5.5" to our large 3.5” x 8.5”. All tickets come printed on your choice of 10 pt. (economical), 14 pt. (standard), or 14 pt. (premium) cardstock. All tickets have multiple numbering and perforation options. 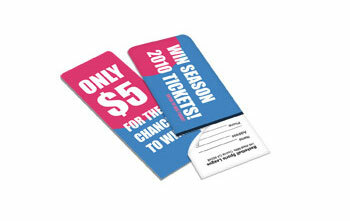 Numbering has many uses and is essential when ordering raffle ticket printing. You can print in color on both sides of your ticket, allowing for many creative designs. In addition, you can choose between matte or high-gloss UV coating although we also have an uncoated option. Our tickets can be printed on the same day you submit your design which makes us the perfect option for rush jobs. Ticket printing offers numerous opportunities to earn more from your events. Numbered tickets are essential for any paid event, allowing you to ensure that all entrants are paid and accounted for. Use space on the back of tickets for promoting yourself or someone else’s business. Our 3.5” x 8.5” page ticket size offers a generous amount of room for ads. Sell the space on your tickets to local advertisers or offer it as a value-added opportunity to your event sponsors. You can also print coupons on the back of tickets, allowing you the ability to track promotions. Raffle ticket printing is a tried-and-true method of raising money. People love the chance to win and feel good about being able to contribute through raffles. To get the most out of your raffle, make sure you print tickets in advance of your event and start selling your raffle tickets early. If you’re planning an event, you can sell attendance tickets at the same time that you offer raffle tickets. Talk to your event sponsors or local businesses about contributing items to raffle off. You can create excitement and sell even more tickets at the event by raffling off items every half hour or hour. Make sure you periodically announce how much time is left to buy tickets until the next raffle.